It all started with a Flipkart sale about a month ago. I'd been eyeing a Harry Potter box-set there for a while, watching the price drop with every sale they had. This time, the price had dropped to an unbelievable Rs 1300 for the entire set - that's less than Rs 200 per book! I figured it could go no lower; I swooped in and bought it. 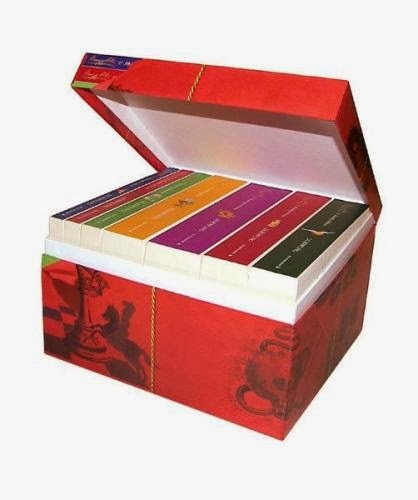 Why a Harry Potter box set? Well, the copies I read and re-read a dozen times as a kid are at my parents' house, and they're much the worse for having been read by two kids so many times. The later books (the humongous ones) are in especially bad shape. And it's an incomplete set - we borrowed the sixth and seventh books from others, so those two are missing. I told myself I was buying the set for my as-yet-imaginary children, but who was I kidding? Of COURSE I was buying them for myself. I'd never read all seven books in one go, which if you really REALLY think about it, means you can't call yourself a Harry Potter fan. Plus my memories of the books had been befouled by the movies, and I wanted to cleanse them. But even after I received the set (and very beautiful it was) I resisted temptation for about two weeks. I knew that if I started reading, I would just get sucked in completely, and there would be nothing else in my life. It's happened to me before, so I know how it works. Unfortunately, other books started being boring. I tried reading some three different books, but was able to finish none. And so I gave in. It started one Friday evening, and ended one Sunday morning two weeks later. I lost two weeks of my life, just like that. I was in between worlds. Outwardly, I was functioning like a normal human being. Inside, I was only half in this world. The other half was firmly at Hogwarts. I had no idea what was going on in the real world - I had stopped reading newspapers because every spare moment was spent glued to the books. But it was so worth it. I am now even more of a Harry Potter fan than before. Having been away from the books for so long, I was able to appreciate the sheer amount of detail in the books much better. And every time I finished a book, I would gaze at Rowling's face on the back-cover and marvel at the fact that all this came out of that head. Interestingly, I realized I could quote entire portions from the first three books verbatim, I'd read them so many times. Even the fourth book was quite familiar, because as a kid, I used to pick my favourite parts of the book and read them again and again. But the fifth book onwards, it was almost like I was reading the books for the first time. I remembered the plot thanks to the movies, of course. But the movies necessarily ignore a lot of detail in the books, which make the latter so much more worth it. The fifth book is by far the worst of the series. It's 800 pages of nothing. I have no idea why it was even written in the first place. The sixth and seventh books are way better, because of the way they tie everything together. I always like it when a bit of history comes in, whether it's Voldemort's or the Potters' or whoever. I realized for the first time that Rowling must have been planning a lot of these things way in advance, probably by the second or third books. They didn't just pop out as she was writing the sixth and seventh books. It's also when you read the books after a long time that you realize how different they are from the movies, especially the later ones. For example, the Invisible Cloak plays quite a large role in the action in the books, but it's barely there in the movies. For obvious reasons, I suppose. And the books are so much lighter than the movies. Rowling's prose, light as sunshine-filled clouds, makes even the darkest of things readable. If I start bashing up the movies, I'll have to write a whole different post. But I have to say - the last scene in the eighth movie with Voldemort laughing (and hugging Malfoy!) is probably the worst scene in all the movies. Which idiot thought of that? Nobody who has read the books even once would think that Voldemort would ever hug somebody or laugh in that ridiculous way. It made him a figure to laugh at rather than fear. I wish they had used SFX for Voldemort rather than extremely stupid make-up, so that Voldemort was shadowy and skeletal and scary rather than just slightly eww. I was sorta disappointed when I revisited Azkaban last year, even though I'd always maintained it was my favouritest book of the lot. Felt sad about it too, cus I definitely don't want to grow up if it means finding Harry Potter less appealing. A marathon sounds like a good idea- maybe it'll help me find my love again. Prisoner of Azkaban is my favourite HP book too!